In 2012, I took a trip that flipped my world upside down and introduced me to a remarkable young girl named Stella. I walked blindly into a journey that lit a fire in my soul so strong that it pushed me to create a book, obtain a second graduate degree and lay the foundation for what is now Resiliency Counseling and Consulting, PLLC. When my husband and I got married twenty years ago, I told him that he could take me anywhere in the world except Africa. No thank you! I enjoy clean running water, electricity, and nice amenities. Plus, if I want to see God’s beautiful creatures like giraffes and zebras, I’ll just cruise on down to the zoo since they already brought them over for me! Additionally, God and I had already worked this situation out way beforehand. As a young child I was one of the top fundraisers for Vacation Bible School to send missionaries all over the world. The motivation for this my friends was not rooted anywhere in Christian love, it was more driven by paralyzing fear! With child like faith, I believed if I funded other people to go to these faraway places, then God would never need me to go. Either God has a great sense of humor or I didn’t raise quite enough VBS funds back in the day because my first time traveling outside the United States landed my plane right on the vast continent of Africa. We Interrupt your regular life program…to take you to the one place you never wanted to go. At the time of my first mission trip, I had been working as a family therapist for almost 12 years and a great deal of my work focused on treating trauma survivors. I was at a point in my career where I felt like I had seen and heard it all. To put it bluntly, I was completely burned out. 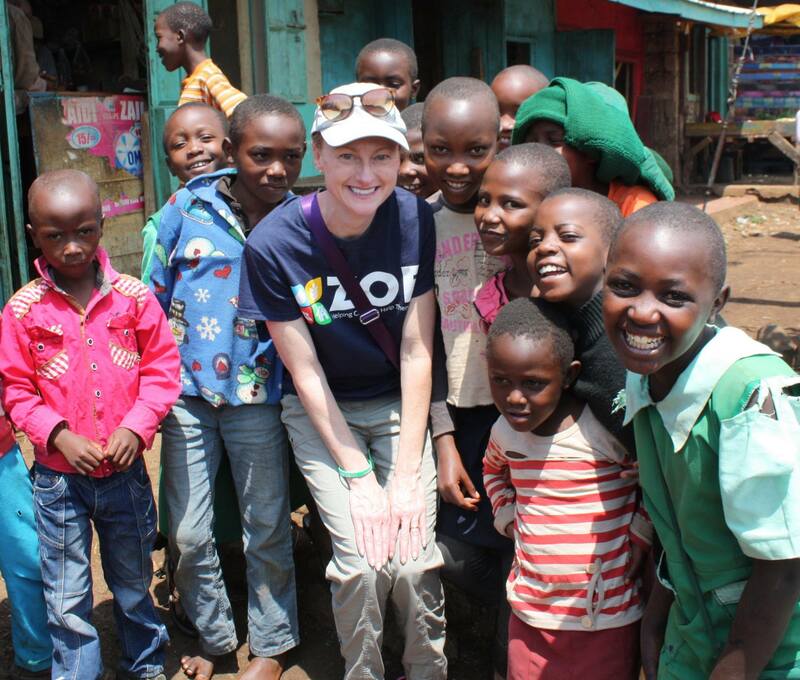 The children and youth we met during our stay were participating in an empowerment program offered through ZOE. The program uses a unique model that keeps orphans and vulnerable children living with their families while moving out of poverty in just three years. Rather than building schools or offering medical services, the purpose of this type of mission experience is to connect and build relationships. Day after day, we would sit circled around together and listen as one by one each child would tell their story of how they came into the program. Most of the children were either total orphans or vulnerable children taking care of sick relatives. A large majority had watched their parents die of HIV, and then been disgracefully shunned by their own relatives and communities after their deaths. As if this wasn’t enough, most of them had endured some type of work exploitation, physical abuse, and or sexual abuse. As I listened to the kids that were near the end of the three-year program share their stories, the first thing that struck me was the way they labeled their tragedies. Instead of using words like troubles, they used the word “Challenges”. Confidently they would say I once had “challenges” like the death of my parents and no food to eat but I found hope and a new way to move forward. As a therapist I couldn’t even think how in such short amount of time these kids could arrive at this place of emotional peace. So just like that, the teacher became the student. One of the most poignant events occurred when our team went to the home of a young girl named Stella. Like so many kids in the ZOE program, Stella’s parents were deceased, and she was caring for her younger siblings. She had a table prepared for us and as we sat at the table, she proceeded to lovingly wash our hands with a pitcher of water. For a follower of Christ, it was as if I had been touched by Jesus. It was one of the most beautiful moments of my life. This young girl, not much older than my own daughter, who just a few months before had been begging for her next meal on the street, was now sharing what she had with complete strangers. Somehow Stella and her peers had learned not only to say, “Life may not always be going the way I think it should… but I am going to be ok”, but additionally they lived with deep gratitude for what they were blessed with each day. In my innocence as a new mission worker, I had been excited for this opportunity to go help these “poor, needy” children in Kenya. Unbeknownst to me, along with my lofty hopes and dreams to help, I carried with me a lifetime of stereotypes and stigma that were being shattered wide open each day. Not only were my beliefs and attitudes rocked to my core, but no less by a group of teenagers who had no running water, electricity and GASP … no advanced college degrees! In our success oriented, consumer driven culture, we are led to believe that nothing bad should ever happen to us and that happiness can be found in the next thing we achieve or purchase. Living under this very narrow and false pretense creates unrealistic expectations and sets us up for failure. It is not realistic to believe that only good things will happen to us and that we will never face challenges, yet, this is marketed to us every single day. If we are willing to let go of these false beliefs and replace them with more realistic thoughts we can build something very important for our brains called margin. This created space of margin allows our brain to process more than one outcome to a situation, thereby allowing for more than one solution. Margin is way more than having a Plan B, it is allowing for the possibility of multiple things to occur. When we hold rigid black and white beliefs about what should happen or should not happen in our lives it only leads to disappointment. Today, take a moment to evaluate where you may have some unrealistic thoughts that could be reshaped to allow margin in your life and allow you space to build resiliency. Remember that resiliency Is accepting that things may not go the way you originally planned but knowing that you will be OK despite these challenges. Practicing gratitude in our lives is a great way to help us daily build resiliency. Find things to be thankful for and focus on those rather than your disappointments. In my next blog, we will explore how my newfound RESILIENCY was tested very quickly after returning home from Kenya as I worked to create a children’s book for ZOE. Until then may you be well, may you be loved, and may you know true peace. Read more about Melissa C. Harrell and her work. Like Resiliency Counseling and Consulting, PLLC on Facebook.